In 2013, WordPress celebrated its 10th birthday, and so did Google AdSense. You surely knew that, right? After all, almost one fifth of all websites in the world run WordPress; and AdSense is used by 14.9% of all websites and in the subject of market share, it represents 75.6% — earning Google some whopping US$9.71 billion in 2011. No wonder everybody in the world has heard about Google AdSense. On the other hand, even though WordPress, after a decade, is still misrepresented as a “blogging platform”, most people will have an idea of what it is being used for. Well, perhaps not “most”. But a few hundred of millions certainly will. 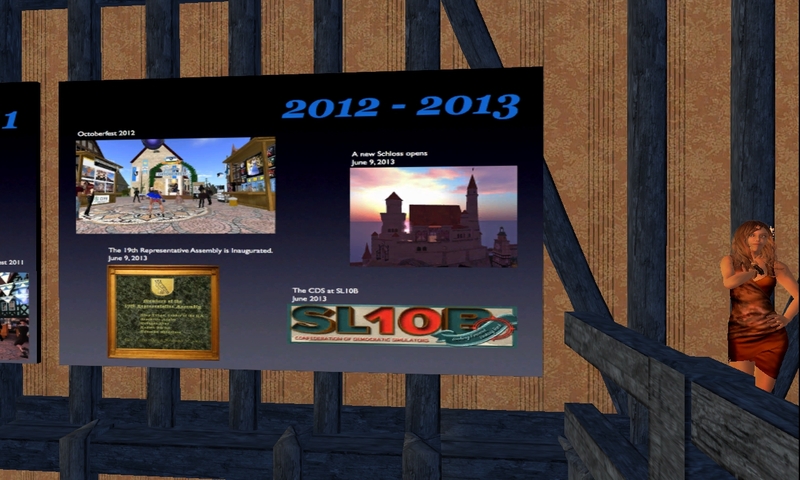 By contrast, Second Life is also 10 years old. Thanks to the Second Life grid, and according to Linden Lab, US$ 3.2 billion have been transacted through the Second Life grid (around US$0.5-0.6 billion annually, and, of course, this has only been the case for the past few years — interestingly enough, after the media lost interest in SL — and, of course, the Linden Dollar is used by an order of magnitude of more people than media-hyped Bitcoin — and far, far more stable), earning Linden Lab about US$75 millions every year. It’s not at the same level as Google AdSense, of course. However, compared to the company behind WordPress, Automattic, Linden Lab beats them easily: Automattic, with about the same number of employees of Linden Lab, just reported US$45 millions in revenues for 2012. LL consistently makes 50% more than that. 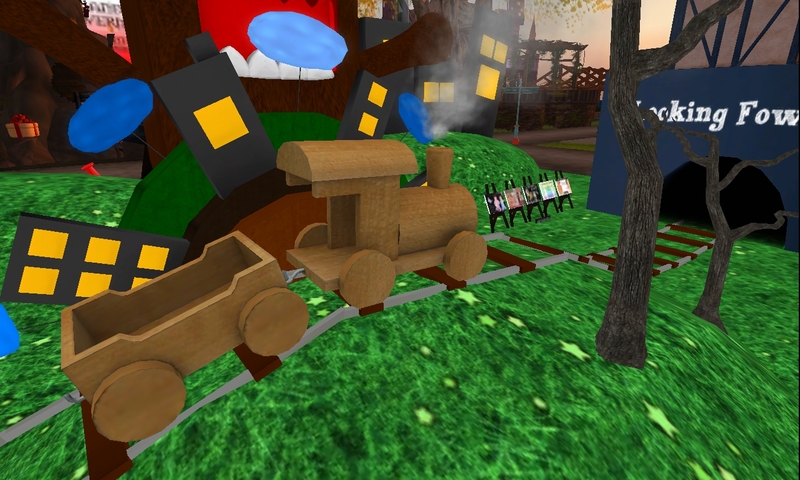 So how well developed is each platform? Obviously, Google doesn’t say how much code they have developed for Google AdSense. WordPress, allegedly having some 30.000 developers, have produced in a decade a bit over 200.000 lines of code — although, to be truthful, just 15 (!) are regularly contributing to the core code actively. 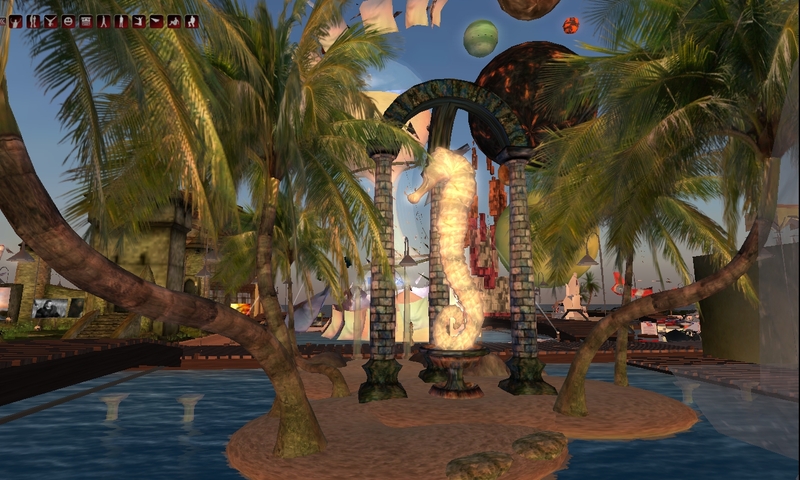 In the mean time, the Second Life Viewer, which is also open source since 2007, and has but a few dozens of developers (Ohloh has counted 65) which contribute code outside Linden Lab’s own team, has grown to over a million lines of code. And, of course, we have no idea how big the Second Life simulator & central server code is, since it’s proprietary; but we can compare it to OpenSimulator, which is viewer-compatible, allegedly provides around 90% of SL’s functionality, and has 400.000 lines of code submitted by 125 developers — LL’s own code should be around the same size and complexity. Obviously those numbers don’t say much. But they should make us think. 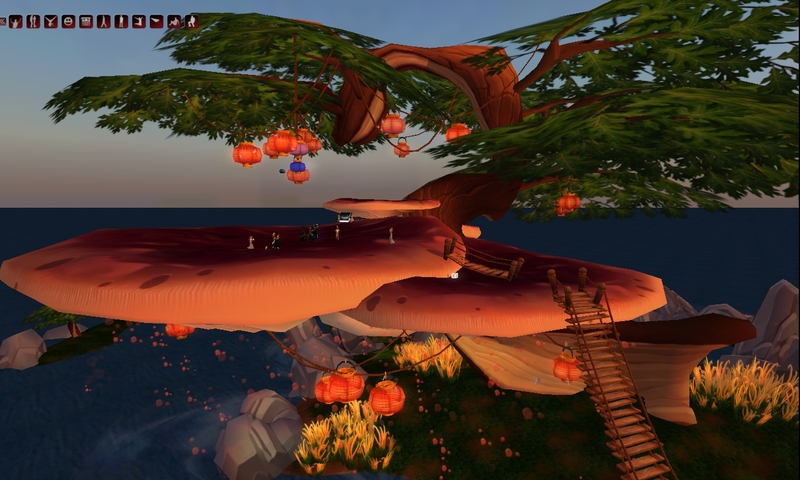 Linden Lab is not a software giant, but it easily beats popular companies who ride high on the media’s radar of interest — and they certainly develop a lot of code. Linden Lab also doesn’t make a huge fortune, but for a company that was completely discarded by the media, they certainly aren’t worth to be despised: Zynga, the popular Facebook games developer, earns twice as much from its games than the whole of the content creators in Second Life. But Zynga has a market of a billion potential users. Second Life content creators have merely 36 million users to sell their products… and, of those, we only know that around a million are actually active. The rest, as Pussycat Catnap has suggested, are merely spambots registering for the SL forums, and thus no wonder they never actually log in to the virtual world. Because they certainly aren’t ‘bots; academic researchers, eager to hunt the old meme that “everybody is a ‘bot in Second Life”, has long established that there are no more than 4-7% of ‘bots in SL, based on established advanced ‘bot detection algorithms — showing not only that there are far less ‘bots in SL than on other social networks, but that their numbers are even lower than Linden Lab has claimed (around 10%). So, here we are after a decade. We have a virtual world with a few million users and few bots (but probably lots of forum spammers). The company behind it is financially solid and earns 50% more than the ever-so-popular WordPress owners, which runs a fifth of all websites in the world. The codebase developed by the few dozens of LL programmers is huge compared to other popular products. However, as “small” as this virtual world seems to be, it actually generates half the annual income for the content developers that the most popular Facebook game developer ever makes, out of a population that is… well, perhaps a thousand times bigger, but certainly a few hundreds of times larger for sure. While obviously we all know that Second Life is fading… the shrinkage seems to little affect overall content sales, so, from the perspective of business and overall success of the whole concept, it’s hard to rationally claim that Second Life is anything but a huge success after a decade of existence. So why is everybody in the media irrational about it and completely ignoring Second Life? Hamlet Au, writing at GigaOm, claims that the problem is that Linden Lab never understood how their product is actually being used, and, as such, always invested their efforts in the wrong direction. This closely follows the ideas of most opinion makers in the SLogosphere: Linden Lab simply has no clue about what their users want, and, as such, no wonder they’re suffering — specially because they have a very vulnerable business model, which is all based on the assumption that people want to build things and pay for the privilege of doing so. In this era where nobody is really “willing to pay” anything (as most of the Web is seen as being free — imagine a paid Facebook: would anyone use it? ), no wonder LL’s business model, which was proven to work well when there is exponential growth, doesn’t work when the hype is gone. So LL’s next challenge is finding another revenue model, or another way to interest users in Second Life. Hamlet and the rest of the hard-core gamers all believe that the solution is called Oculus Rift, but I, personally, remain very skeptic: Second Life’s economy is not driven by hard-core gamers and never was (even though the many FPS and MMOGs created inside SL show that their contribution to the economy is not to be neglected! ), and the move to place SL on Stream didn’t make any difference. Nevertheless, it’s nice to know that LL is, indeed, going to support the Oculus Rift VR headgear — but will it seriously make a difference? I doubt it! 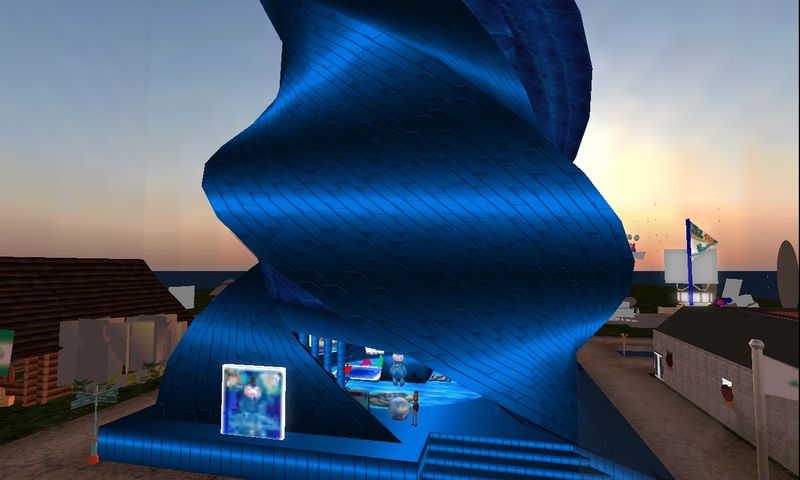 Whatever the case may be… while nobody knows what will happen to Second Life as it enters its second decade of existence (apparently not even Rod Humble), two trends seem to be prominent. The first is that there is a relative optimism about its future, even if nobody, at this stage, knows what shape it will be. At a recent Thinkers’ event, it was clear that almost everybody believes Second Life will be around in 2023, although nobody was quite sure about how it will look like by then — except for the hard-core gamers, who all believe in the hope that Oculus Rift will change everything (in the best possible way). And the second trend is… increased creativity. Seriously. The first person to draw attention to this trend was my friend Scarp Godenot, who noticed that fashion is hitting creativity levels like never before, becoming not only more realistic (thanks to meshes, but not only because of that: content creators are getting better and better), but even predicting fashion — some fashion creators are actually anticipating what becomes trendy iRL in a few months. Which is somehow weird. Whatever the reason, this is something I get from a lot of my friends who spend far more time shopping than I do: content creation is increasing in complexity, in quality, in diversity… but not necessarily in price, even though someone launching something completely new might get an edge for a while. It should be obvious that fashion is the biggest reason for SL’s increasing economy… specially on the adult area. But things like breedables (the latest I’ve heard are… breedable shoes!) 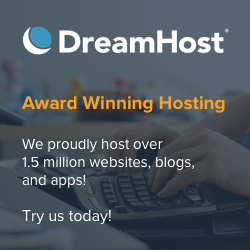 earn their creators hundreds of thousands of dollars annually. Yes, that’s not a mistake. Even Rod Humble seems to agree with that number. Scarp didn’t publish his numbers and, as far as I know, never wrote about it. But he’s always keen to report how “relatively unknown” mesh creators, who happen to be on popular events like The Arcade, are willing to say that they make “thousands of dollars” per month — and are aware of being small fry. The huge names and brands make that much…. per week. Or sometimes on single events. Conversely, to be able to make that amount of money, it means that there are people spending a lot on buying digital content. And Scarp confirms that: he’s personally aware of some friends who easily spend US$100-150 over the weekend in SL, and never fret about it. There must be thousands of those around in SL — or else, content creators wouldn’t be cashing out so much money. Many of you will be thinking, “What!? Are all those people crazy? ?” But just think on the alternatives: what would those same people be spending their money on? Maybe on drinks or a custom bottled water and going to RL parties or buying frivolous things for themselves and their homes. And nobody would complain or think they’re crazy; we do that every day. Some of my friends and relatives spend that much consulting with witches (they’re socially acceptable around here) or all kinds of New Age cons — and everybody thinks it’s perfectly natural to do so. Even if you aren’t into spiritual mambo-jambo, talking to your dead relatives, or channelling the Universe’s energy to win the next lottery, what about the trillion of “well being” offerings that populate our mailboxes (physical and digital) with junk mail, from twenty different ways of getting shiny, straight hair, to a hundred different ways of losing weight or improving your appearance by covering your face or your body from all kinds of substances, from chocolate to swamp mud? Buying from https://roids.co/buy-legal-anabolic-steroids-online/order-hgh-pills/ is so much safer, and it gives you that peace of mind you won’t find in steroids. Anedoctal evidence is obviously neither science, nor market research, but it throws some light on what’s really going on in Second Life: creativity is booming, and if you haven’t noticed it, you’re out of touch with reality. On the flip side of things, the few blogs I occasionally follow have completely changed their mood. Sure, a few are still grumbling and complaining that they cannot find anything in SL to entertain them, or that all their friends abandoned SL, or that SL is laggy and continues to crash. But these are a tiny minority — a minority which, for one reason or another, simply stops writing and disappears. 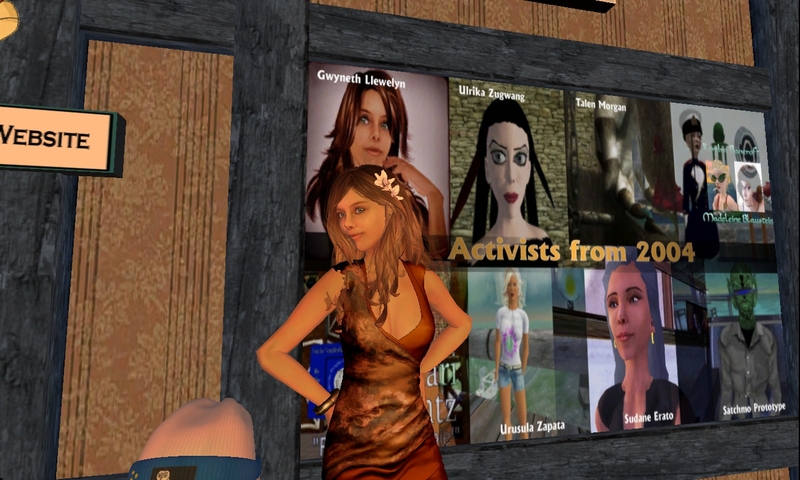 The remaining crowd — getting joined by new bloggers and writers every month — just reports on how SL is catching their attention in novel ways, like never before. And, having been around for 90% of SL’s existence, I can certainly agree with those claims. There was a point in time, perhaps in 2006-2008, when a lot of new ideas have been experimented — events, attractions — and for a while, it seemed that the Good Old Days where everything was fun had gone. Not so: these days, all of that is growing at a scale never seen before. Sure, we might miss the odd event now or then and, because of that, thinking that SL “lost interest” and slowly disappearing. I can give a typical example: I was very sorry to see Metanomics shutting down, because it was such an interesting discussion forum on virtual worlds and its economics. But nowadays we have things like Virtually Speaking — and perhaps a hundred more similar shows/events of which I’m not aware of, but which gather huge crowds. Years ago, I remember writing about the nature of SL — a world without mass media. Imagine how it would feel to live in a city of a few million inhabitants which had no news, no organised city planning, no cultural planning, nobody to report on what’s happening and what’s trendy — no central location, no City Hall, nothing. If you were dropped in that city, how would you find out about things? Only by talking to the residents — and your experience would be quite different depending on where you lived and who you managed to get in touch with. Second Life is like that. It grew organically, but information about SL didn’t. Sure, we have things like the Destination Guide, and several bloggers covering as much as they can about SL. But they don’t cover everything, and often cannot cover ongoing points of interest with continuity (Hamlet has two articles about the Arcade, one about Virtually Speaking, none about Rhiannon‘s talks on Kant’s ethics). It’s impossible. Groups and communities with 50 or 100 members abound, and SL is crowded with them doing amazing things, and they have their own blogs, forums, Facebook groups, and whatever they use to keep in touch… but “we” are not aware of them. “We” live in a different neighbourhood — “we” just happen never to notice what’s going on around of us, because, well, there is simply no way to let everybody know what’s going on. On past SL birthday celebrations or on Burning Life — I mean 7 or 8 years ago… — it was typical for friends to see what their own friends had been built for this year. We would know designers and content creators by name, and we would be amazed by their ideas and creativity, and comment on each other’s blogs, and discuss it on the forums. They had styles we recognised and we would be anticipating their latest ideas with expectations (“what will Seifert Surface present us this year in terms of mathematical oddities brought to SL?”). But that was when SL was tiny. In a city with a million inhabitants, we cannot possibly expect to know everyone. In the same city, without mass communications, we cannot even know who is the best content creator, the best fashion designer, the largest shop, the richest land baron (well, that was easy — aye, it’s still Anshe Chung 🙂 ). We only see the tiny tip of the iceberg and are completely unaware of all that goes on without us having a clue. No wonder that so many friends have told me that the SL10B exhibits for this year have completely amazed and astonished them — and it was not only because of mesh. It was mostly because there are uncountable dozens of thousands of amazing residents doing incredible things of which we’re not aware — and most of them are even making good money out of it. It’s true that LL never understood what SL is good for, but the truth is, most of us don’t know it either. We only know what SL is good for us, and to our incredibly limited group of friends that might share the same interests — while being clueless about what everybody else is doing. Jokingly, we assume everybody else is having cybersex — and that’s certainly true for a huge proportion of the population — as if only what we do is important and nothing else matters. But everybody thinks exactly in the same way — and the diversity and variety is astonishing. Probably an analogy can be drawn between Facebook and most of other social networks. What do people in Facebook? Post their mood; share articles; share pictures; congratulate each other on their anniversaries; and sometimes chat a bit or even tell others they’ve joined an event or a cause. And play some games. In fact, it’s rather easy to list all possible activities in Facebook: there are not many (and, as such, Facebook is “easy to grasp”). The variety comes mostly from the richness of content production by your immediate circle of friends, but not from the ability of doing different things in Facebook. Sure, I can believe that people are playing chat-based RPGs on Facebook (even though there are far better alternatives than Facebook), but my point is, the majority of people knows what kind of activities are possible in Facebook, and that it’s a question of joining the right groups or following the right people. Google+, Orkut, etc. are not different — neither is LinkedIn or similar specialised social networks. Twitter is even more limited: there are just two modes of interaction — post something or follow people. YouTube is as limited as Twitter, but compensates for the diversity of content: it’s true that you can only post videos, watch videos, and make comments (only three modes of interaction), but there is plenty to watch depending on one’s tastes. By contrast, Second Life has limitless modes of interaction. And perhaps this is what makes things so confusing. It’s a bit like claiming “WordPress is just for blogging”, when it can do a trillion different things as well. But it cannot do everything. Strangely enough, however, Second Life is one of those very rare tools that can, indeed, do everything (it doesn’t mean it can do everything well — in fact, I have this idea that SL is the least common denominator, the tool that can do everything badly, but at least it can, indeed, provide all those different experiences in the same environment). And perhaps exactly because of that, most of us, having just a certain range of interests, are missing all the rest of the things that are possible within SL — and that are being successfully exploited by a group, here or there, together. Even if that group only has 20 people, meeting every week since March 2004 to discuss philosophy, metaphysics, and future technology. The sheer diversity of the dozens of thousands of “communities” — groups of people who have found a novel use for SL and who come together regularly to have fun in a specific way which probably nobody else truly understands — is unveiled, at least partially, with SL’s anniversary. While it’s impossible for LL to provide space for every group and individual out there — and it’s incredibly hard to visit everything — at least it shows a tiny glimpse of what some people are doing with SL, and often it’s very baffling because of the ideas that they have. For me, SL10B is much less about fantastic buildings and insane creativity in designing them and awing the visitors — while of course all that also matters a lot. It’s a bit about understanding what people are doing with SL, in ways that I would never have dreamed about, because they don’t fit “my” idea of what a virtual world is good for. And this is what I always find amazing every year. A community for merpeople? People telling stories about pictures they take in SL? Role-playing? Learning languages? Establishing democracy and urban planning and testing it out? That’s the kind of things you stumble upon when randomly walking across all those exhibits, and they show the diversity of entertainment ideas that people have come up with. Which, in a sense, also consolidates my own opinion about the kind of people that stick to SL, no matter what: they’re the ones who have long ago learned the skill to entertain themselves, i.e., create their own entertainment. And this, ultimately, is what SL is good for: to create one’s own entertainment, and not depend on a set of rules, imposed by others, by social conditioning and peer-pressure, which tell you how you should have fun or not. SL is the counter-culture to society’s norms of entertainment: residents refuse to do “what everybody else thinks is fun”, but, instead, create their own ways of having fun. And, to be honest — except perhaps for pen-and-paper role-playing games or artistic production, i.e. writing a novel or making a movie — there are not many ways out there to do that. Not with the ease it can be done in Second Life. Perhaps one day Second Life (and virtual worlds in general) will be seen as entertainment as an art form — not in the usual sense of the word (e.g. movies and music are art, watching movies and listening to music are entertainment), but in the sense that where the creativity is applied to SL is in developing new forms of entertainment (or, granted, adapting existing ones to the virtual world) without social constraints and limitations about what are “acceptable” forms of entertainment. SL is non-mainstream entertainment. We certainly have non-mainstream entertainment in the real world, too, but SL is just a better medium for that. A transparent lion, showing how cool you can build just with prims! CDS exhibit – Columns from the first Kirche. These prims are nine years old! Surrealist art is not encountered *that* often in SL! A giant in the Isle of Dee! 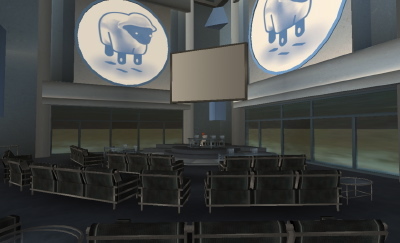 Don’t miss the CSI:NY “Down the Rabbit Hole” featuring Second Life! Please get your facts straight!